Thaw broccoli in microwave oven or at room temperature, drain well on paper towels. Place muffins on baking sheet, broil turning once, until lightly toasted. Remove and turn cut side up. 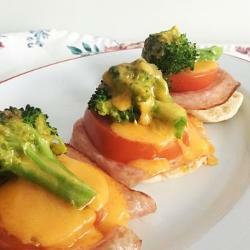 Top each with slice of ham and tomato, top with broccoli. Broil for 3 minutes or until cheese is melted and bubbly.